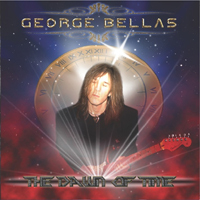 After picking up his first guitar at the age of 7, George Bellas practiced like mad to become what he is today – a major exponent of the neoclassical and progressive guitar genre. 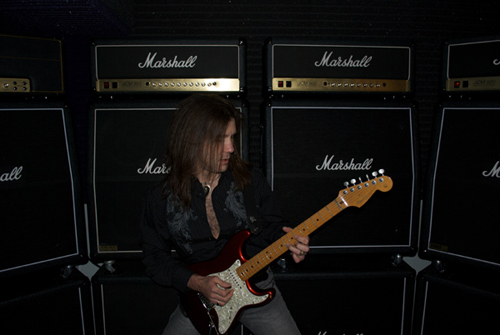 His playing can be heard on several solo albums of his as well as on others by Mogg/Way (UFO), Magellan, John West and Vitalij Kuprij, to name but a few. His involvement in music doesn’t stop there – George also plays bass and keyboards, composes music and is a highly regarded tutor. The format is not peculiar in my mind, that assessment is based on what everybody else does. For "Step Into The Future" I wrote one song, and due to its 75 minute length, that is all I could quite obviously fit onto a standard length CD. The album was not composed as separate songs that were later segued together, it was from start to finish written as one continuous piece of music. I was inspired at the time by modern composing techniques and elements, a few of which include: poly-meters, odd-meters, interval sets, twelve-tone serialism, quartal harmony, quintal harmony, polychords, exotic scales and unusual harmonization techniques, not to mention the outlandish form. The concept of the album was based upon visions of the future in which I tried to depict in music. Thank you for the nice comment. I don't only compose for guitar, I thoroughly compose all the parts for all my music, which includes: guitar, bass, drums, piano, flute, oboe, clarinet, English horn, bassoon, French horn, trumpet, trombone, tuba, violin, viola, cello, contrabass, harp, glockenspiel, tubular bells, xylophone, timpani, choir, synthesizer and other miscellaneous instruments. And yes, of course Vitalij and I have are own unique composing styles - just as Franz Liszt's approach to writing for piano was unique to Fredric Chopin's. There are many aspects unique to each other's styles, but one thing we are both fond of is incorporating classical elements within a rock context. In “Extreme Measures” there are passages where Vitalij and you trade off melodies so perfectly. For me that suggests you two get on very well together. Are there are any plans for the two of you to record together any time soon? Easily. I do not necessarily subscribe to the belief of that study though, it is not just about the time involved, but the	quality of time is what is paramount in ones development. There are countless musicians that have put in a great amount of hours but have not pushed their abilities to the degree that is necessary to achieve what you have suggested. But, that is not even necessary to be able to have fun and enjoy the beauty of what playing an instrument can bring into a person's life. Be it a hobby or profession, both can be equally gratifying throughout a lifetime. An extreme performing virtuoso. His melodies, harmony and virtuosic nature of his piano playing has always been very inspiring to me. Album available on Lion Music.